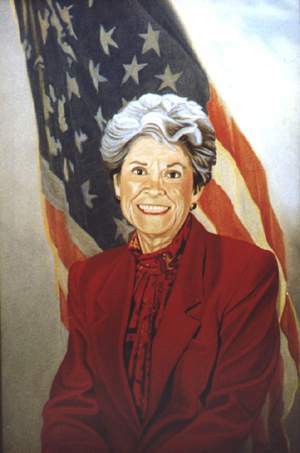 In 1999, as artist in resident, Wildcat completed a painting of a dramatic moment in Kansas nationally significant labor history for Pittsburg Kansas. The painting, Solidarity, (9ft. x 12ft, oil on canvas) is now on exhibit in their Public Library, and was sponsored by PAACA, the KAC, Pittsburg and Girard School districts, & Pittsburg State University (Wildcat taught an art class there, and PSU provided a residence for the artist & his wife in the historic Sperry Nature Retreat ) Solidarity stands as a visible record of that community s history, and of their participation in researching & creating that history as art. Summer 2001, Wildcat was a Millennium artist, in Guam for six weeks as artist in resident, Artist Creates for the Millennium. He was one of 56 artist who were matched with host sites for artists chosen as Millennium artists, a grant sponsored by the Mid Atlantic Arts Alliance, and NEA. A documentary book is in the works about each of the 56 artist in residencies. Quest for Freedom features scenes from the civil rights movement, and the Mission to land a man on the moon. Quest for Freedom (9'.x30'. oil on canvas) will be on exhibit at the LBJ Presidential Library and Museum in Austin Texas, Oct 19-Dec 15 2002, in conjunction with a traveling exhibit of photo of the civil rights movement from the Smithsonian Museum. 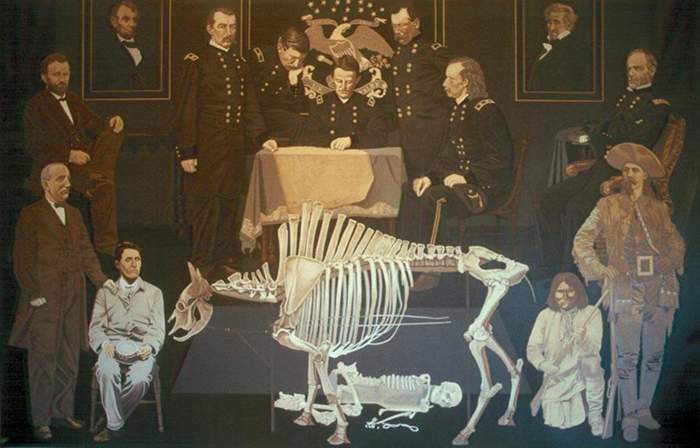 The painting was on exhibit at the Lawrence Public Library , fall 2000, for a visit from the Curator of the LBJ Museum and Library. Wildcat has been invited to exhibit his art at the United Nations, May 2002, The Strategy and Ceremony. Wildcat is ready to paint the struggle that made Kansas a Free State, portraying the Abolitionists and those who rode and served on the Underground Railroad. Wayne hopes that this painting will allow the state and the Lawrence community to see many of their heroes who lived and died so that Kansas and the nation might be free of slavery. Wildcat s public art can be seen at various locations, and Wildcat Studio is open by appointment. He exhibits in one man shows, and at conferences and venues related to themes in his art. Central Time is on exhibit at Central Junior High, 14th & Massachusetts, Lawrence, Kansas. Dream for Harmony is on exhibit at Harmon High School, Kansas City Kansas. Solidarity is on exhibit at Pittsburg Library, Pittsburg Kansas. Posters are available of this painting. 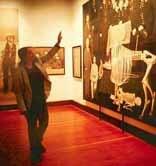 Many of his paintings, large and small, are available for exhibits, conferences, and for private sale or as a purchased donation to a museum. The artist is available for lectures about his art, and the process of creating it. Students watch attentively as Wildcat paints. 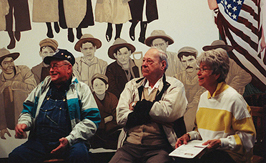 Wayne talks about the miners of Crawford County Kansas with his epic painting Solidarity.